Listen to the audio of our January 2017 WATERritual here. Preparation: Set your ritual space with five unlit candles (four in a circle with one in the center), matches, things you will carry or wear at the march (like banners, signs, scarves, shoes, etc. 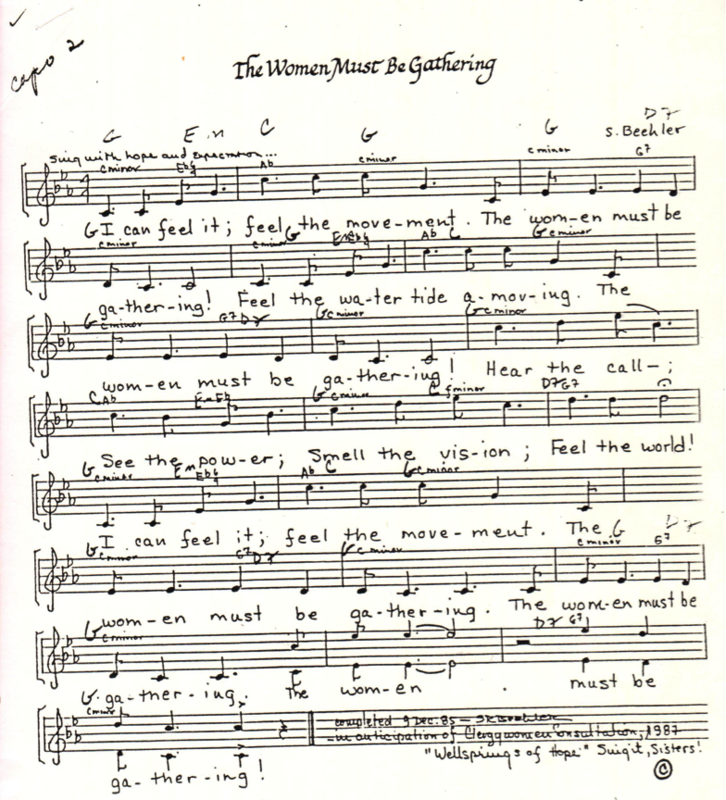 ), and a printed copy of the two graphics shown here under “Walking Meditation.” (See the “Take Action” section at the end of the ritual to find a link to all the official art of the march). Welcome to this timely WATERritual, “Women Marching in Solidarity: on Washington and around the Globe.” We have been organizing at WATER around four R’s: Resistance, Resilience, Resurgence of hope, Revolution. They structure this ritual. Throngs of women, supportive men and children will march on Washington, in most major cities in the United States, and worldwide on the day after the Inauguration. Why? Many of us are insulted, scared, and threatened by the words and actions of the elections. We are confronted with the question of how to move forward in the face of serious national and international concern and fear. According to the official Women’s March on Washington platform, we are marching to “affirm our shared humanity and pronounce our bold message of resistance and self-determination.” We march to exercise our first amendment right to free speech; the cornerstone of democracy. The Women’s Marches will send a bold message to the new government on their first day in office that women’s rights are human rights. We are driven by a multitude of issues. Among them: gay rights, gun control, immigrant rights, equal pay, reproductive freedom, racial justice, workers’ rights, and climate change. We stand together recognizing that defending the most marginalized among us is defending all of us. Tonight we gather in solidarity with marchers everywhere and pray that ALL people marching will be safe and EVERY March will be peaceful. 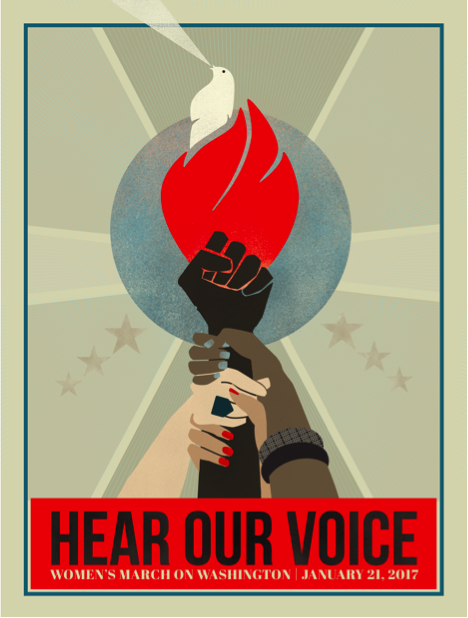 Share your name, where you are geographically, where you will be marching on Saturday, and what women, past and present, do you carry with you? For movements that came before us: the suffragists and abolitionists, the American Indian, the Farm Workers, the Civil Rights, Second Wave Feminism, Black Lives Matter, Occupy Wall Street, the fight for LGBTQ rights, and many more. Response: Gratitude, Gracias, Merci, Danke! For those who will march on January 21, and after. To date 370 Sister Marches have been organized in all 50 states and in more than 40 countries. Many have emailed us at WATER about the March in their city. Others have sent strengthening messages of solidarity to carry with us as we march. Here are some highlights from what we have heard about the Marches happening around the world. We are good news bearers, women as well as men. We are the good news. All of us. Yes We Can, Blessings, See you on the trail!!! We are absolutely with you for this march on 21st January and stand up for women’s rights and affirm our diversity. I want to add a fourth ‘R’ to resistance, resilience, resurgence of hope, REVOLUTION! A word to say that I (and many others) will be with you in spirit from Winnipeg, Manitoba, Canada. As Adrienne Rich says in one of her poems (and Carolyn McDade set to music), “I have to cast my lot with those who, age after age, perversely, with no extraordinary power, reconstitute the world.” In solidarity and hope. Our church community will hold you in the light of Justice in all of it’s forms this coming Sunday in light of your march the following weekend. Peace with justice. And to all others who are marching in other cities and who have sent us messages of hope and solidarity, we thank you and will carry your spirit with us: Kitty Stafford, Edmonton, Alberta, Canada; Linda Hurcombe, Shropshire, UK; Renate Rothwell, London, UK; Denise Starkey, St. Paul, MN; Hope Bauerlin, Aston, PA; Ann Larson, Essex, VT; Marianne Duddy-Burke, Elisabeth Schüssler-Fiorenza, Boston, MA; Jan and Moe, Denver, CO; Elise DeGooyer, Seattle, WA; Diza Velasco, St. Louis, MO; Ann Fontaine, Astoria, OR; Erma Durkin, Baltimore, MD; Susan Thistlethwaite, Chicago, IL; Mary E. Hobgood, Los Angeles, CA; Gwen Sayler, Dubuque, IA; Rosemary Ganley, Peterborough, Ontario, Canada; Carol Christ, Lesbos, Greece. Many: “We stand together in solidarity | with our partners and children | for the protection of our rights, | our safety, our health, and our families -| recognizing that our vibrant and diverse communities | are the strength of our country. Tonight we light five candles to put a protective light around the marchers. Light of the South: We light the candle of the South to represent those marching in the Southern states, Mexico, Latin America and worldwide for immigrant and refugee rights, racial justice, ending police brutality, racial profiling and our country’s mass incarceration. Response: We hear your voice. Light of the East: We light the candle of the East in solidarity with those marching on the East coast for gun control, recognizing that LGBTQIA rights are human rights and recognizing the rights of people with disabilities. Light of the North: We light the candle of the North in solidarity with those in the Northern states and Canada who march for equal pay, reproductive freedom, paid family leave, and ending violence against women. Light of the West: We light the candle of the West in solidarity with the indigenous women who march for their sacred spaces and the right for their voices to be heard, especially those at Standing Rock. Light of the Center: We light the Center candle in solidarity with those who are marching in Washington, DC for gender and racial justice, equal pay and the protection of our environment and climate, along with access to clean water for everyone in the wake of the Flint Water Crisis. Let us take in the power of this light. Our Jewish sisters have taught us to put our hands around this light and bring the power of the light to our eyes three times. Please join me. Reflection: What are your thoughts and feelings as women prepare to March on Saturday? What blessing do you offer them? ‘It shall not be done’—yet they do it. land—as we prepare for this physical and symbolic journey. Give us sturdy feet and strong hearts to do what we plan. Crush arrogance through the voices of women. Hear our voices. 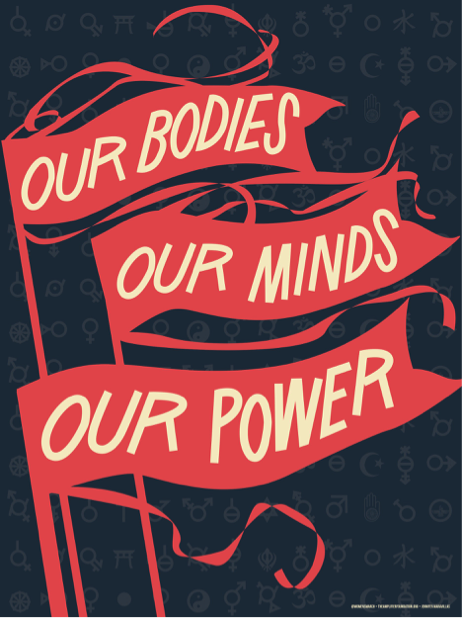 Our bodies, our minds, our power belong to us. Let us bless Our bodies, Our minds, Our power. Embrace yourself. Let us bless our symbols. Extend your hands over the banners, signs, scarves, shoes, and posters. Let us offer blessings of safety and non-violence for the March and the Inauguration. Extend your hands over all who are on this call, all travelers, all police and first responders, and all who plan to march. No place, inside or out, that did not remind us of fear or terror, despair and loss, anger and grief. Yet, on one of those days, someone did turn. Turned to face himself, herself. Turning to one another with forgiveness and a longing for peace in their hearts. At first, the turning made people dizzy, even silly. Until even the nay-sayers began to smile and sway. Might be seen and respected. Making it clear all were loved, nothing separate.